Bolt-On 4-Link for 1970-1981 Camaro / Firebird. For use with CoilOvers or Shockwaves. 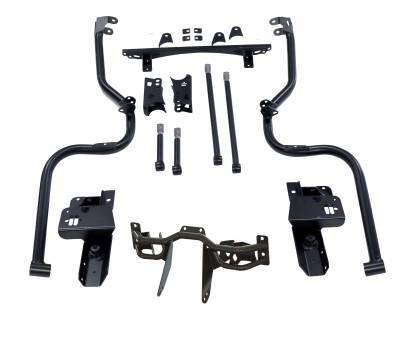 Includes Uni-Cradle, adjustable upper bars with R-Joint, non adjustable lower bars with R-Joints, all mounting brackets and hardware. Bolt-On 4-Link for 1970-1981 Camaro/Firebird. For use with CoilOvers or Shockwaves. Includes Uni-Cradle, adjustable upper bars with R-Joint, non-adjustable lower bars with R-Joints, all mounting brackets and hardware. RideTech is proud to introduce an all-new 4-Link rear suspension system specifically for 1970-1981 Camaros and Firebirds. The design delivers exceptional performance with minimal cutting and almost no welding required. Equally important, the unique design addresses production variations and frame rail thickness issues that are common to the second-generation F-Body platform. RideTech developed an innovative “unicradle” design that is significant in two ways. Lateral tubes index off of the leaf spring mounting points rather than the frame rails. A separate steel brace bolts to the inside of the rear bulkhead area (in the cockpit) behind the seat to locate the forward mounting points of the upper link bars. The clean-sheet design offers long upper link bars with revised mounting points for improved roll center, forward bite and anti-squat characteristics. The rear bulkhead in these cars (structure between passenger compartment and trunck) exhibit excellent strength — especially where the bulkhead ties into the floorpan at the transmission tunnel. RideTech engineered a brace that bolts to both the bulkhead and the rear edge of the transmission tunnel while still allowing you to run a full back seat. Simple holes are drilled into the bulkhead without any welding of the unibody structure. equipment. Furthermore, second generation F-bodies exhibit inherent variations in frame rail thickness. Our self-contained design is an innovative solution with excellent geometry and a straightforward installation process. The design offers dramatic gains with respect to both handling and ride quality.